School self-evaluation empowers a school community to identify and affirm good practice, and to identify and take action on areas that merit improvement. School self-evaluation is primarily about schools taking ownership of their own development and improvement. School self-evaluation was formally introduced into the Irish school system in 2012 as a collaborative, reflective process of internal school review, focused on school improvement. School self-evaluation further develops the school development planning process and focuses it firmly on teaching and learning. Circular 0040/2012 required all schools to engage in the school self-evaluation process and set out its purpose and rationale. Circular 0040/2016 sets out how schools should continue to implement school self-evaluation. 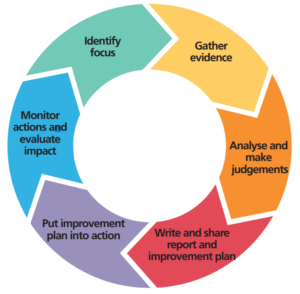 School self-evaluation involves reflective enquiry leading to action planning for improvement that is informed by evidence gathered within each school’s unique context. The process enables us in Coláiste Pobail Acla to use this evidence to identify meaningful and specific targets and actions for improvement that focus on teaching and learning practices. It enables us to create and implement improvement plans, to measure our progress, and to identify our achievements. In our ongoing engagement with school self-evaluation, we continue to focus on teaching and learning. We continue to use the process to implement national initiatives and to identify and work on aspects of our own school’s teaching and learning practices which require development and improvement. As in most post-primary schools, we are using the school self-evaluation process in the 2017-2020 period to maintain a meaningful focus on literacy and numeracy and to assist us in introducing and embedding the Framework for Junior Cycle 2015. Click here to view our SSE Report & School Improvement Plan.